Boxcutters, Jigger, Shaker Classic/Boston, Citrus Juicer, Strainer, Rocks Glass. Fill a Shaker with ice, then pour in Bourbon, Ginger Syrup and Apple Juice; shake until cold. Strain the mixture into a glass with ice. 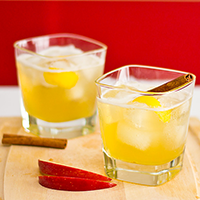 Garnish with a Lemon Peel and Cinnamon Stick.